Required for the Sail Canada "Intermediate Cruising Standard"
Required for the Sail Canada "Advanced Cruising Standard"
The Home Study course materials cover both the Basic and the Intermediate Coastal Navigation standards. You can do the basic course only, do both levels or if you have the basic standard just take the intermediate level. You will require a proctor to receive, administer and return the exam. This could be a co-worker or someone else you know (not family members). Libraries & schools sometimes offer this service as well. The curriculum covers the role of the navigator and introduces the publications, aids to navigation, tools and techniques that support planning and safe passage making. The student is exposed to basic plotting and position determination methods. This course covers information key to the effective use of electronics. 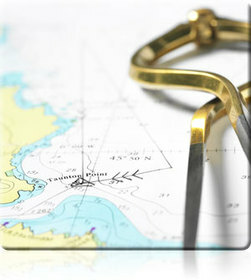 ​After successful completion, you can continue the course at anytime to complete the Intermediate Coastal Navigation. The curriculum focus is on near shore navigation and covers position determination methods using non-electronic means as well as methods for dealing with current and leeway. The course also covers the determination of intermediate tidal heights and introduces the student to the basics of passage planning and to the impact that the Collision Regulations may have on navigational practice. Plotting of latitude and longitude, laying off a course, dead reckoning, measuring distance, Variation. 3. Discuss specific questions from students. Bring your own chart & plotting tools. Course & exercise book, Chart 3463 (Georgia Strait South), plotting materials (square plotter, parallel ruler & dividers), email & phone access to instructor, exam reviews, Sail Canada exam & certification fees. Please note: The course material includes everything you need for the Intermediate Navigation. Access to instructor, exam reviews, Sail Canada exam & certification fees. ​Please note: You will need the course material from the basic course.